Join in on this family-friendly Milwaukee community event that celebrates hopes, our strength as a community, and willingness to end gun violence. *PLEASE NOTE* There are two ways to join in on this event. #1 As participants. Come, have fun, be with your community. #2 as Helpers. 10 families are needed in 2 shifts as game leaders (everything will be provided). What does Orange Day represent? Orange is the color that Hadiya Pendleton’s friends wore in her honor when she was shot and killed in Chicago at the age of 15— just one week after performing at President Obama’s 2nd inaugural parade in 2013. After her death, they asked us to stand up, speak out, and Wear Orange to raise awareness about gun violence. 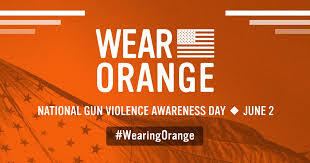 We wear orange for Hadiya and to honor the more than 90 lives cut short and the hundreds more injured by gun violence every day — and to demand action. Orange is what hunters wear in the woods to protect themselves and others from harm. Orange is a bright, bold color that demands to be seen. Orange expresses our collective hope as a nation — a hope for a future free from gun violence. ACTIVITIES: Games, lives music, interactive art, yoga and many more family friendly activities! PARTICIPANT CAP: The more the merrier.